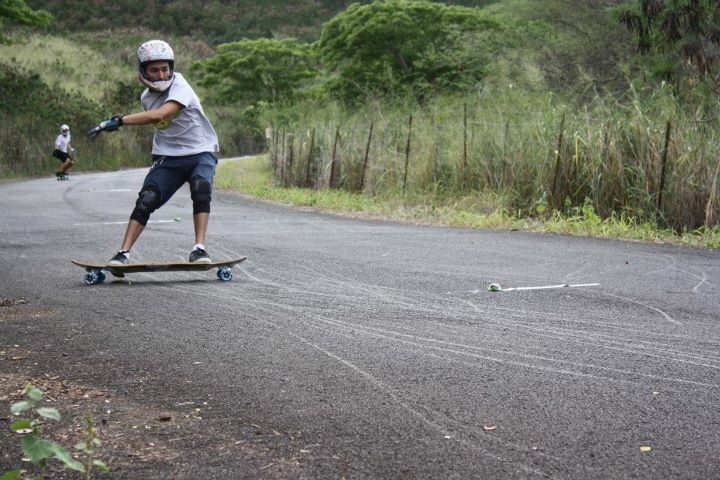 HawaiiWinterOutlawSeriesEvent6. - The Festival of Sugar and Love 4. 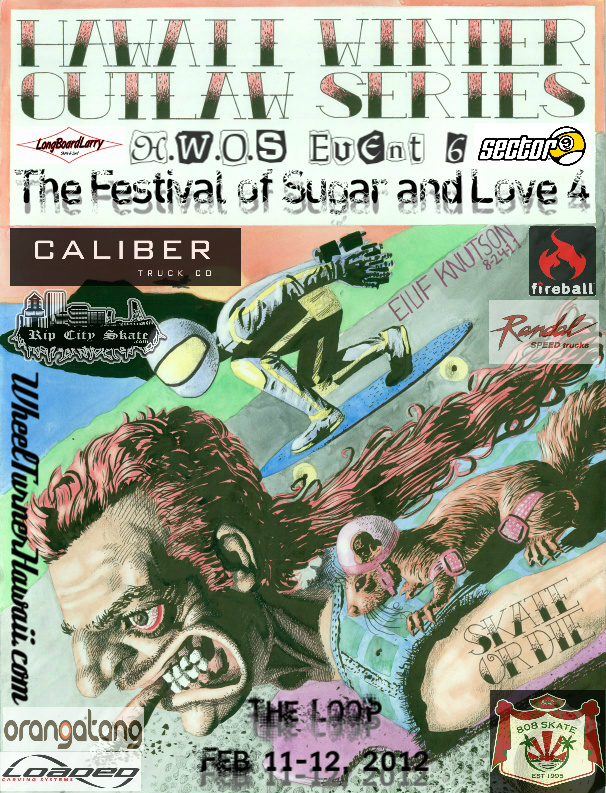 Its February which means its time for the 6th and FINAL event of the 2011-2012 Hawaii Winter Outlaw Series... and The Festival of Sugar and Love 4 is guaranteed to be a BANGer to finish off the season. 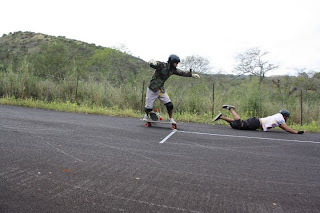 Through out the 2 day long festival, skaters will jam all types of terrain and events to try to be the overall F.O.S.A.L champ. Over the past 3 years, the slide jam was the main event. This year there will be a few more little twists to become the winner. 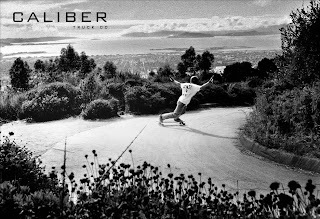 Slide jam, some obstacles, maybe a little death slalom, limbo, all terrain challenge.... we will se what goes down. Just be ready! Like the past years we will be camping, BUT this year ONLY COMPETITORS will be allowed to stay once the park is closed. ALL COMPETITORS NEED TO GET SIGNED UP BY FEB. 5th AT THE LATEST! Register by emailing your name to Stokedskaters@aol.com. If you are under 18, please inform me in the email and ill let you know what needs to be done in order for you to camp. 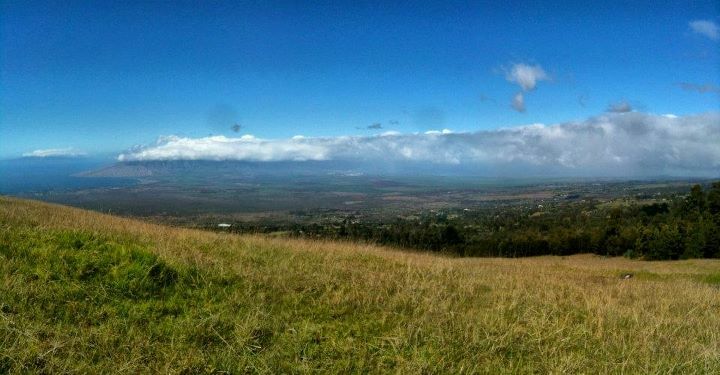 This is one of Hawaii's longest running events, so you won't want to miss is! Get signed up and we will see you on Feb 11 and 12th for F.O.S.A.L 4! The Festival of Sugar and Love 4. Meet @10am on Sat. the 11th. $20 Entry Fee. -Includes Camping. HWOS4 The Maui Challenge. Full Results and point awarding. 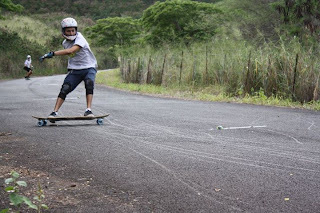 Skateboarder’s from all across the island chain gathered on Maui, Dec 20 – 21st for the fourth event of the Hawaii Winter Outlaw Series, “ The Maui Challenge”. Within the two days, skaters rolled down all sorts of world class terrain during the back to back double event. Two events gave riders double the points, and they were shredding hard to make it count. Unlike our other events, this one was on a little less of a set schedule. Skaters just knew when and where to show up the first day… the rest was up to the riders. Day one was slide jam day. Everyone met up and the planned spot to discuss where the jam was to be held. The original spot that everyone was thinking had very patchy/ cloudy conditions… so the jam moved down the mountain a bit to a steep, straight, wide road. The twenty five skaters decided on a 45min. 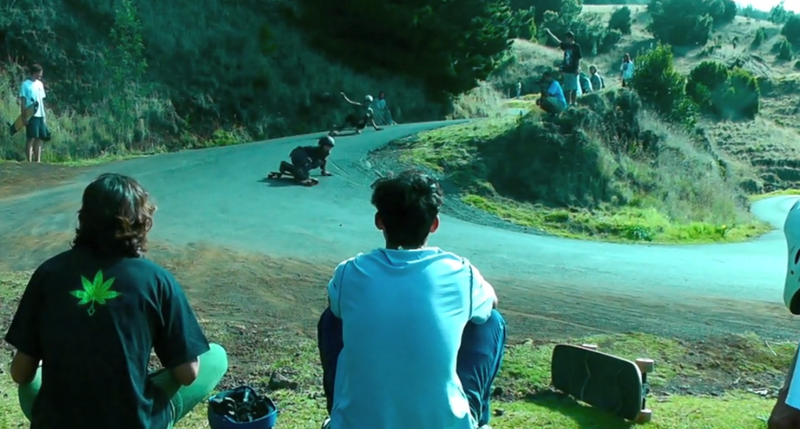 Jam style sesh, riders judge the first round. From the very first run in the timed sesh everyone was killing it. Our slide jams here really show all sorts of styles. 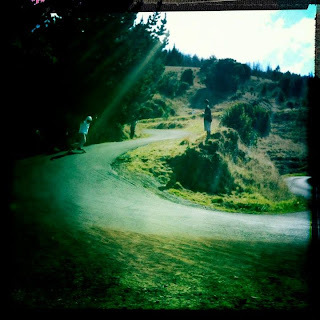 Fast big standups, techy spiny slides, hand down spins, grass lines, tre flips… all kinds of fun. When the 45min was up everyone gathered at the bottom for a rest and to decide who would move on. After discussing it for a bit everyone decided on a top six riders. 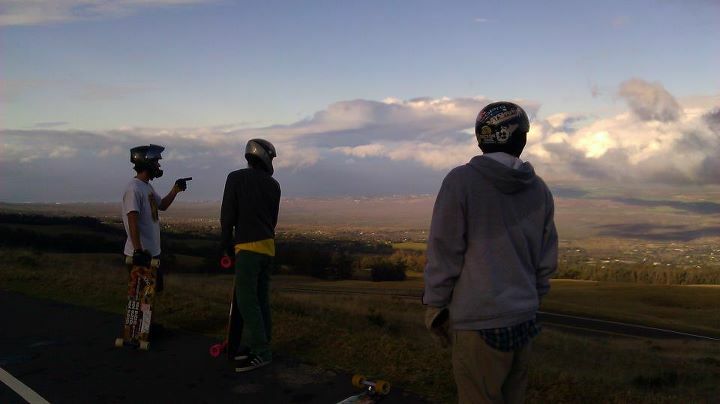 Zack, Jeff, Rhys, Toa, KJ and Pono. Now they each got two runs to showcase their skill n steeze. The first run everyone took seemed to be a little slower but full of every trick you could think of. For the second run the speed picked up a bit, some riders even changed boards. Now the game seemed to be fastttttt huge standups. Everyone agreed to decide on a top three skaters to do a few more runs… but choosing who the top 3 definitely took some time and a lotta crowd cheers. Now walking up the hill for their final two runs is Zach, KJ and Toa… amped and ready to throw down. First down the hill was Zach, mixing his smooth style with huge standies. FS, BS, switch… even with a couple shuv its to finish them off. The longest stand up slides we saw all day! Next up was KJ, starting first run of two on his double kicktail. 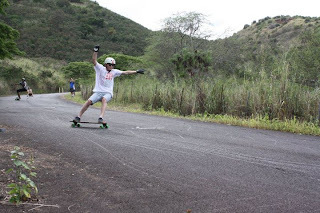 During this run we saw a bunch of fast techy slides finished off with a stand up 540! The next run he took was on his speedboard and the pace picked up quite bit when KJ tucked the whole hill straight into one fast slide. 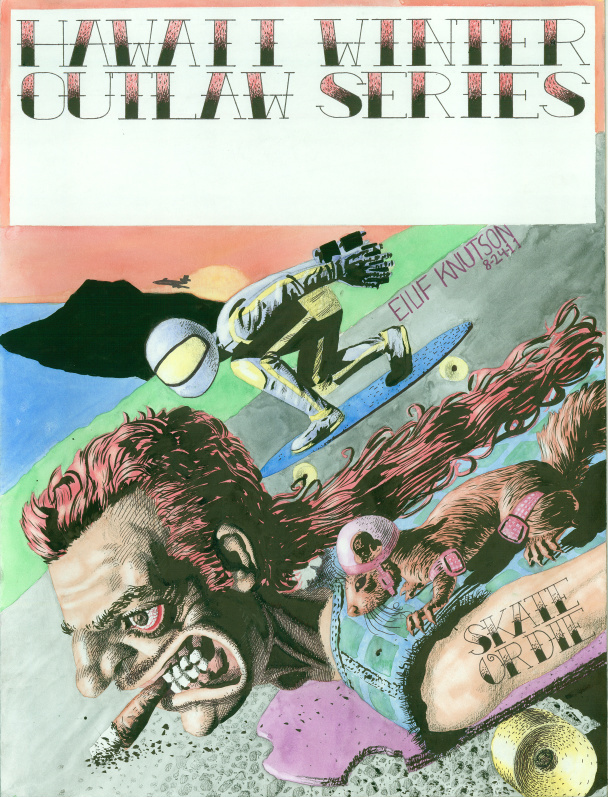 The last rider of the jam was the grom, Toa. This kid pulled all kinds of things in his runs. Back n fourth between regular and switch. Shuv its. 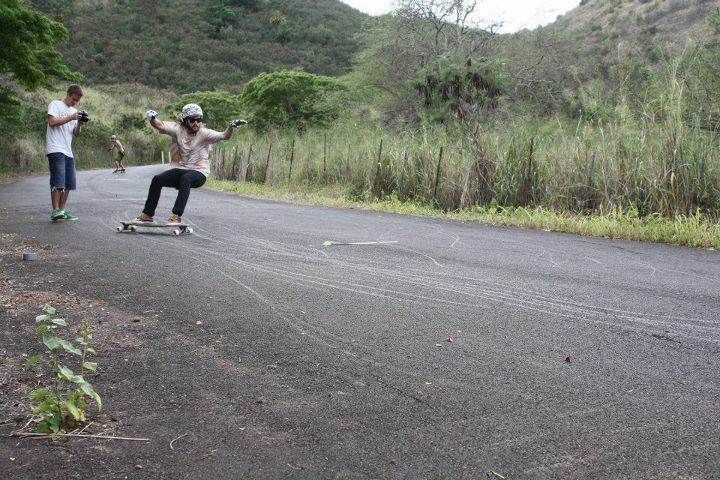 Even a grass line slide to hippie jump. When all of their runs were complete everyone wanted them to keep going!... but they were way to exhausted. Now the judges and crowd took some time to talk about the final results. Coming out on top of the Maui Challenge slide jam was Oahu’s KJ Nakanelua. In second was a new Maui resident Zach, and rounding off the podium was Mililani grom Toa Nanpei. All of the finalist were STOKED to get a bunch of gear along with CASH MONEY thanks to our awesomely supportive sponsors! The next day was race day and everyone was up early ready to go. Once again when everyone met on the original planned race spot it was a little damp. BUT that isn’t an issue on Maui. 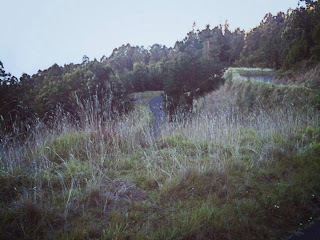 There is an abundance of PERFECT roads on one mountain. So we moved to another (perfect) course. The riders decided to hold the first round on a 4 mile stretch of bendy butter near by. The course is fairly long with constant banked bends that you don’t need to break a tuck for. A very “ Jakes Rash” type course. Drafting is the name of the game for this round. The 30 racers got signed up, brackets were made and everyone started getting prepared to race. Eight heats of stoked racers lined up at the start line and the heats began. Tight packs from beginning to end were a familiar sight in this round. Tons of passes back and fourth between racers. A couple crashes from some tight racing but everyone would get up and charge right back down the hill. Round 2 is set and ready to go within minutes. The first heat is on the line, when our friends from the Maui Police Department arrived. We took a break, talked to the officer who was very nice and understanding. Found out they were just worried because there were lots of semi trucks on the day we had chosen due to a road widening project. So we said MAHALO! And moved on to, once again another different AMAZING course 5 minutes up the road. Racers were more then pleased with the change of course. From full tucking now to a narrow, turny as F*#K , hairpin infested slab of butter in the middle of the clouds. More “ Giants Head” style. Heats were adjusted from 4 man to 2 man due to the conditions of the race course, brackets were set up once again and the race was ON! Racing on this road proved to be INTENSE. Racers were nearly side by side through out the whole course. Passes and crashes in the tightest of turns. It really proved which riders were on point. After round two the quarter finals ( Top 8 ) were set for Kaimana P vs Cookie, Ethan L vs Rhys M, Dakota ( Maui ) vs Brian (B.I) and Mackenzie Y. vs Pono A. (Maui). This round was HEAVY. The skaters were showing they were a lot more comfortable racing this course. Every heat was nearly flawless. Racers almost synchronized from start to finish. Coming out on top and moving onto the semi finals was Rhys M vs Cookie and Dakota vs Mackenzie Y. In heat one Rhys got in front off of the start with Cookie right on his tail with no fear. Both riders (one reg, on goofy) went through all of the tight drifty turns clean and the heat ended how it started… Rhys in front with Cookie following closely behind. Dakota got in front of Mackenzie off of the start in the second heat. Riders stayed close through the whole course and both pulled clean drifts for the last hairpin. Exiting, the skaters were almost side by side starting a pump battle… Mackenzie stumbles while pumping behind Dakota and Maui moves onto the finals. It’s consi’s and Cookie gets out in the front of Mackenzie. Both riders take the course clean but Mackenzie comes out of the last hairpin with a little more speed to make the pass in the final straight for 3rd place. In the finals Rhys and Dakota kick out next to each other with their decided 2 push start. As they come into the last hairpin, skating confident all day, Rhys goes full speed into a perfect drift while Dakota scrubs a LITTLE too much speed giving Rhys the lead in the last straight to take 1st! Following the finals we had our awards ceremony where finalist treated to great prizes and dollah dollah bills yall! Decks, wheels, trucks, shirts, and tons more were given out to top racers. Sponsors hooked us up to where EVERYONE on the hill with a skateboard got to take home some schwag! The Hawaii Winter Outlaw Series is stoked we were blessed with the chance to have The First Annual Maui Challenge go down. 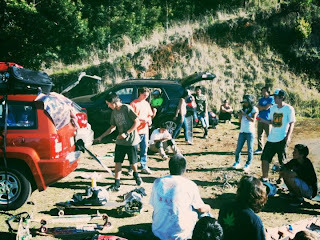 Wheel turners from all islands were able to gather, session and have a good time with GREAT vibes. Gatherings like this are helping our scene stronger then it’s ever been. 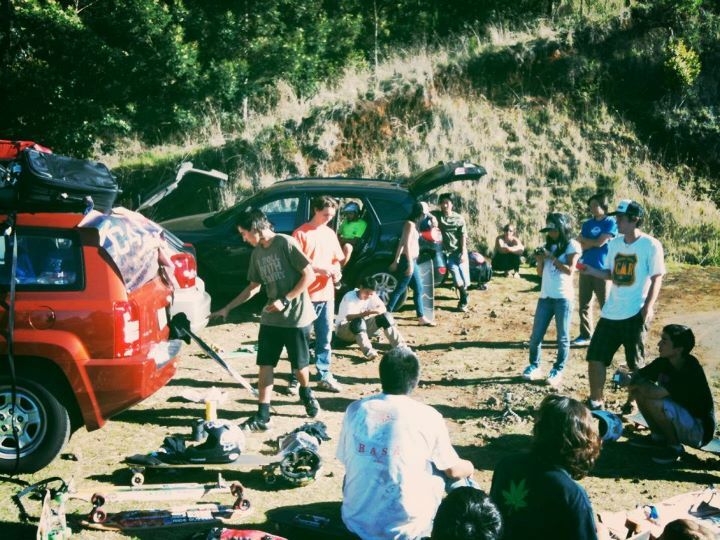 Hawaii’s skate scene has huge potential and it’s starting to show. We will definitely be back next year for the HWOS Maui Challenge 2! 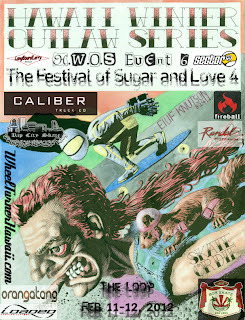 Hawaii Winter Outlaw Series Event 4. – The Maui Challenge. Hawaii Winter Outlaw Series Event 4 VIDEO preview. All Photos taken by Mason and Maika.